If you've never been part of a candy scramble, you don't know what you are missing! Yes, the game is practically as simple as its name indicates, but the fun that results is well worth the effort. Regardless of the simplicity, kids of all ages really seem to enjoy it. Candy games are always a big hit because the prize is something almost everyone loves - all the candy you can grab! The competition of "getting there first" adds to the excitement and adrenalin, not to mention the laughs. If you are going to incorporate this game into your party or event agenda, there are a few tips I'd like to share with you to help make this candy game a success. 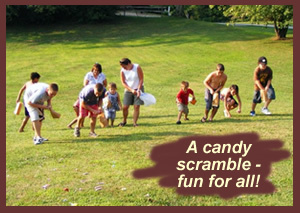 A candy scramble is a game that can be played indoors or outdoors. Personally, I prefer outdoors in a nice grassy field or yard whenever possible. However, I realize that outdoors is not always an option, depending on the weather or venue. Never fear! You can incorporate the basic rules and technique to suit your indoor space as needed. You may just need to break the "scramble" into smaller groups to avoid stomped on fingers, etc., and allow for elbow room if you've got a large group. The candy from your scramble can be used as the party favor if you like. If you decide to go that route, simply pick up some party favor bags and hand the empty bags out just before the scramble begins. Having an individual bag for each player makes it easier for them to hang onto their goodies as they are racing around willy-nilly. It told you this was a simple game to implement, and I wasn't kidding! Scatter the candy over as large an area as possible. 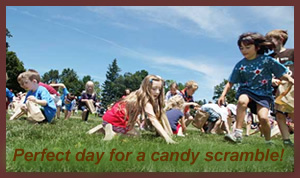 This will help to reduce the chances of injury from over-excited children scrambling for candy in a congested spot. If you have a wide range of ages to work with, divide the children into age appropriate groups and have more than one scramble. This helps ensure that the little kids have a fair chance. Don't allow the parents to get involved unless the children are extremely young. Parents can be a problem when fighting for their kids "fair share." :) They can be worse than the kids! Have some extra candy set aside "just in case" you have any dramas, tantrums, or hurt feelings to deal with. You don't want to have to take candy from one child to give to another. If you have some excess stash, you can smooth troubled souls by slipping some in their bag and turn their frown upside down. 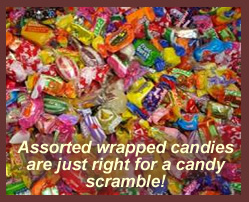 We've enjoyed many a candy scramble in our family. We've used this fun candy game for family reunions, church events, holiday parties, and any time we want to do something the kids will love. My dad has his own "twist" to the scramble, and that includes hay, candy, and money. I'll be telling you about that version of this game later this week. It's particularly fun for autumn parties when hayrides are par for the course and hay is readily available. Don't forget to take a few moments to share your own party candy games with us. Of course, we'd love to hear how your scramble went and see some photos of the event. Please do post them.